Clipsal Area Lighting Panels provide a simple way to realize daylight harvesting schemes in an individual conference room or suite within a commercial building. They are designed to meet energy code requirements related to reduction in lighting loads by integrating natural light with artificial light. Panels can be set up as a stand-alone system or connected as a part of a larger Square D Clipsal network. A simple Cat-5 cable connection gives the pre-engineered enclosed panels the ability to integrate light-level detection, occupancy detection, keypads and switching. Panels automatically dim lights to capitalize on available natural light, and automatically turn lights off after room is empty. Various pre-programmed lighting scenes can be automatically executed by the panel by pressing a button on a lighting control keypad. Power is distributed to the panel from a single home-run connection to the power source. 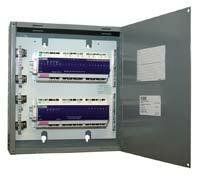 Panels consist of a NEMA 1 enclosure with Clipsal DIN rail-mounted, microprocessor-based output modules. Several options are available, including a four-channel relay output package, an eight-channel relay output package, and four-channel relay and four-channel 0-10V dimming packages. Relay models have four or eight robust 20A relay outputs and are available in both 120V and 277V. Dimming models are available in both 120V and 277V and include four 20A relay outputs and four 0-10V outputs for control of dimmable fluorescent ballasts. All Area Lighting Panel configurations are available with a power supply, which provides extra power to the network when multiple keypads or sensors are required.